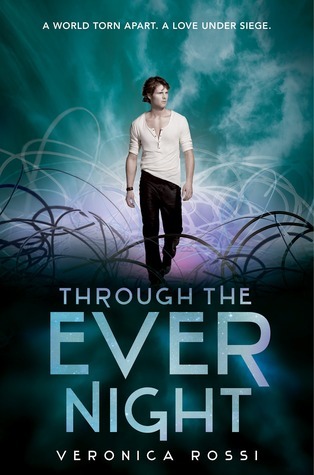 Through the Ever Night by Veronica Rossi is another of my most anticipated 2013 reads so thankyou kindly to Harper Teen and Edelweiss for the opportunity to read an ARC. I am always nervous about reading a sequel after the first book was so memorable but I am pleased to say this book exceeded all of my expectations, which were quite high. Through the Ever Night takes place a few months after Under the Never Sky. Aria has been tasked with the job of searching for Still Blue in order to save Reverie as well as locate Perry’s nephew Talon all the while avoiding the Aesther storms. Perry is now the Blood Lord of The Tides; he has a huge responsibility over his people which is cause for much strain and tension during perilous times, add to that his relationship with Aria who isn’t accepted by The Tides and you can say he has a lot on his plate but he handles it all with maturity and strength. Despite Aria and Perry being apart for most of the book, I still adore the relationship they share; it made their moments together all the more sweet and enjoyable but there was also tension and misunderstanding and it made me question whether or not their relationship would hold strong with so many obstacles standing in their way. With the book told from alternating POV’s, it was great to get insight into each of their thought processes. Through the Ever Night appeals to my love of character driven novels, I adore each of the relationships these characters have and the bond between them, especially Aria and Roar who share the most wonderful friendship and quite different to that of Aria and Perry which is oh so sweet and endearing – all of the interactions and dialogue really holds my attention. Each character, secondary included are fleshed out well and have their own distinctive personality which shines across the pages and really makes for an enjoyable reading experience. In my review of the first book, I was clueless about the Aesther so I am pleased we learnt more about it, we also get more insight about both the Dwellers and Savages and I think the story has been set-up perfectly for the final instalment although there is still much to find out. Veronica Rossi’s writing is flawless, the world she has created is unique, scary and imaginative; it is filled with so many moments where I was either clutching the pages in anticipation or frantically turning them trying to get to certain chapter parts, it was cling to the edge of the seat reading that has left me needing the next book stat. Overall, Through the Ever Night certainly lived up to my expectations; the tone was darker, it was filled with adventure, danger, angst, heartbreak and a wonderfully sweet romance. I am so excited for Into the Still Blue to see where the amazingly talented Veronica Rossi takes this brilliant story. I absolutely agree with you on every single word you wrote. Aria and Roar have such a wonderful friendship and one I'm incredibly invested in. This book was much better than I'd dared hope and Rossi's writing really IS flawless, not to mention her sense of pacing. I read Through the Ever Night yesterday, and completely agree w/you! It was brilliant. Now for the dreadfully long wait for Into the Still Blue. Thanks Andrea :) that the bad thing about reading books as soon as they are released - the wait is agonising! I really, really have to start this series. I'm kicking myself so hard for turning down the first book, especially now that I'm seeing how much everyone is loving the second book. I love your review! It makes me want to go grab both of them and start reading right now, seriously. Thanks Keertana :-) its just a shame we have a year to wait. Wow awesome review Sharon, I grabbed book one and cannot wait to start this series! Great review, Sharon! I'm so glad you loved this one too. Veronica has such an amazing talent. I was kind of wary too since I LOVED Under the Never Sky, but TTEN was just as good, if not better. I love the relationships and characters too. She just did such a fantastic job, and I can't wait for the next book!